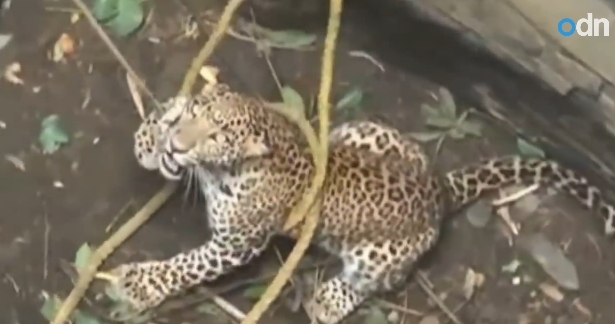 A wild leopard has been rescued from the bottom of a well in a rural part of India. A group of villagers and forest officials rescued the animal after it found itself trapped at the bottom of a well in a rural area of Panchmahal district in the Indian state of Gujarat. Local men involved in the effort said they had heard noises from the spot and then discovered it stuck inside. The rescuers attempted to ensnare the leopard in a rope, but the animal growled and pounced fiercely when it was being caught. Eventually the leopard was saved without sustaining any injuries. Report by Claire Mewse. These villagers, however, chose to help as opposed to killing the cat or leaving it to die. The frightened animal wasn’t too keen on the rescue efforts being made, but his heroes were able to pull it off without hurting him. Once out of the well, the leopard was taken to an area a safe distance away from the village and released into the wild again, proving that there’s always a humane choice. Responses to " Dramatic footage: Wild leopard rescued from a well in India"